I was on the fence with this one – pure blood legacy game. You know, you purchase game, played it few times, finished it and then throw it in the garbage bin. But theme was appealing for me, so I took a dive and bought it. With my sons summer holiday in progress, we find ourselves third player and start the game. For those few that did not heard of this game, this is first pure “legacy” game on the market. Term “legacy” is used for games in which you make some interventions on their components and in return, game play changes. They are played in multiple sessions, and changes made enable gameplay to change and to make every session slightly different. With usual board games, you tend to protect components (sleeving cards etc. ), but in this, you are instructed by the game to destroy some cards occasionally. You can tear them apart, or be more creative, like burning or eating them. You can find strange satisfaction in destroying cards. 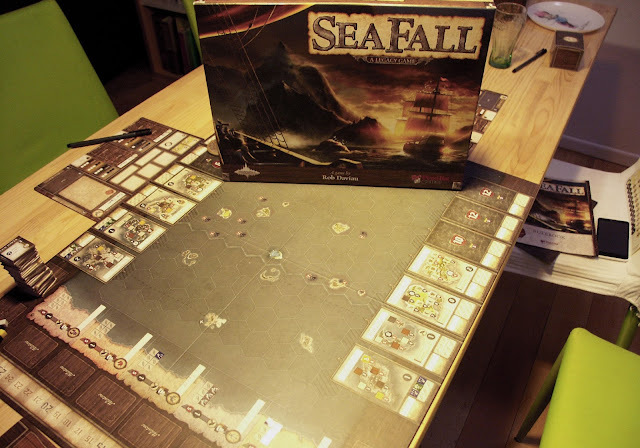 Basically game is send box age of sails game. Going west from your native land, as a leader of your people, you can explore, be a pirate, merchant or start the war and pillage other nations (it’s more in a sense of “letter of marque” than full-out war). All this happens in a course of multiple games (25-30). And there is a hint of a mystery, but three games in, I can’t tell you match about it (some kind of Ancients).You have two ships for you ventures, and that will not change. I expected this game to be campaign game, like Kingdom Death for example. In campaign games your character evolves, game evolves, and even gameplay evolves. Some time you have some kind of reset just to make campaign longer (in KD you star to hunt one kind of monster, it is hard at the beginning, but after few games with evolution of your characters it become easer; then you start to hunt monster of higher level and its hard again, so it’s like some kind of reset). In legacy games reset is at the beginning of every game. In Sea Fall you character and ships evolves a bit, your home province evolves a bit, but from game to game you can keep only one advisor card (if you win, chances are you won’t), and few research or ---------- (no spoilers here) cards. All buildings you build, all upgrades for your ships, all money you earned, everything is gone at the end of game session. You start almost fresh every game. I don’t say it is bad; it’s just different that I expected. In fact, it is good, because it serves as kind of equalizer, not letting any player to become overpowered. This has one more consequence – from game to game you can choose different roles, you don’t have to stick to one you chose in first game. I think that game even force you to do that if you want to win. And that is a second difference between campaign and legacy game. Game plays very smoothly, except that you will occasionally look at the rulebook even after few games. And here we come to gray shadow over this game. Rule book is not the perfect one. The problem is, I presume, the legacy aspect of the game. You simple are not allowed to know all the rules upfront, before your first game. You are forced, from game to game, to read rules again just to figure out how new rule goes along with old ones. Sometimes you just don’t know what to do, because you cannot find example in the rules. It is hard to explain it without going in a specific case, and if I go that route, I will spoil game for those who not played it yet. After few games I have a feeling of RPG in this game, not knowing exactly where it comes from. Probably from emersion in the theme this game creates.